The COOL-SPACE fans are a very cost effective, easy-to-use and environmentally friendly solution for cooling areas that need short term or temporary cooling or where flexibility is required. They are portable, so it is easy to cool and move! There are three principle sizes of product that can cool areas from 500 square feet up to 4000 square feet! All you need is a water supply and a single-phase electricity outlet. How would you like to be 28 degrees cooler this summer? One of the largest dangers in the hot summer months is being over-heated. That is an issue that we ourselves are careful to guard against in our own plant. Our guys are out there in 90-degree heat, building paint booths and shipping product. Our paint booth department actually works the early shift, starting at 6AM so they can leave before the really hot part of the afternoon. It is very important to follow some safety guidelines (like staying well hydrated), as well as keep our plant as cool as possible. One of the ways we keep our space cool is by using Cool-Space evaporating cooling fans. 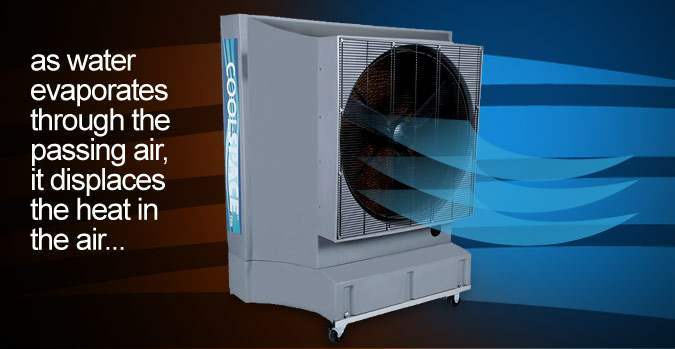 The COOL-SPACE range of portable evaporate coolers provides a very cost effective, easy-to-use and environmentally friendly solution for cooling areas that need short term or temporary cooling or where flexibility is required. They are portable, so it is easy to cool and move! There are three principle sizes of product that can cool areas from 500 square feet up to 4000 square feet! All you need is a water supply and a single-phase electricity outlet. Read more and find the right cooler for you in their Buyer’s Guide. But, How Does Cool-Space Fans Work? The 8” thick cooling medium in the heart of the evaporate cooler lowers the ambient temperature by up to 28°F (depending on the relative humidity). The fan pulls in the hot air; it passes through the 8” medium pad, soaked with water and provides the cooling effect. The cooler air is then re-added to the environment and immediately provides a cooler atmosphere. They work in situations where conventional air conditioning won’t work or would be too expensive to operate. Some examples are automotive shops, industrial warehouses, airplane hangers, dry cleaners, outdoor tents, lawn and garden shops and horse stables. We not only use Cool-Space in our warehouse, we also offer Cool-Space as a product to our customers! You can see some product videos on their YouTube Page.